I wrote back in February and many times before about the incredibly rich dataset produced by MIT’s Charles Stewart as part of the Survey of the Performance of American Elections (SPAE). The information contained in that set – thanks to interviews with thousands of people nationwide – is an invaluable individual-level view of the election process. The challenge with such a datafile, however, is that it can be daunting to read and analyze; numbers may be powerful, but they aren’t always easy to decipher. That’s why I was delighted to see Charles point on Twitter to a new visualization of the SPAE data by Ursula Kaczmarek of the US and Overseas Vote Foundation. Each of these pages gives the reader an opportunity to drill down into the data and see not just top-level results but also breakdowns by age, race, ethnicity and geography. The result is a much deeper understanding of the landscape of opinions across the nation. This site is just another example of the power of design to make complex ideas more accessible to researchers, advocates and anyone interested in the field of elections. It’s well worth a look, followed by a bookmark in your browser of choice so you can return again and again (because I bet you will). I can’t thank Ursula enough for her work in bringing this data to life (not her first work, by the way; check out her other gorgeous election data visualizations) – and, as always, thanks to Charles for his continued work on the SPAE. It really is the gift that keeps on giving. 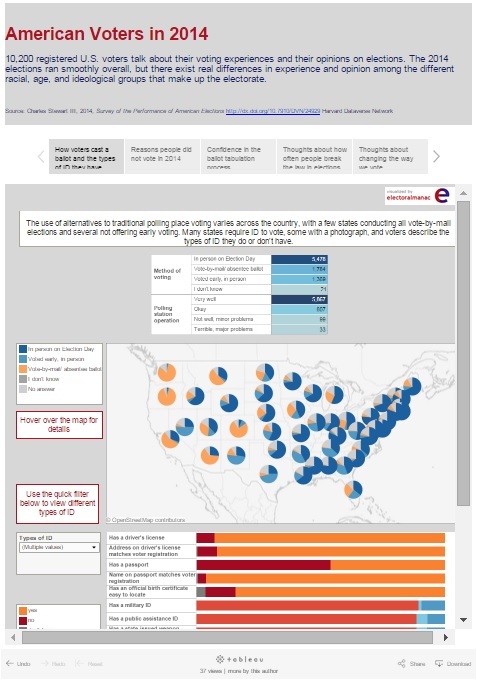 Be the first to comment on "Election Geekery, Looking Good: New Site Makes SPAE Data Beautiful"